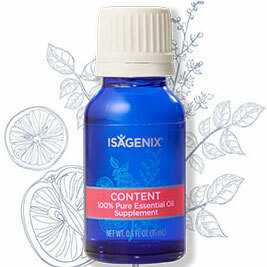 Isagenix Content is a proprietary blend of ten powerful pure essential oils that emanates a sweet, spicy herbal aroma. It was specifically formulated to increase metabolism and to help control hunger cravings. When taken daily, Isagenix Content helps to manage munchie urges while effectively and safely boosting a healthy metabolism and a feeling of satisfaction. When used in combination with an exercise program and a healthy eating plan, Isagenix Content is a perfect complement for Shake and Cleanse Days. Isagenix Content is safe for topical, aromatic, and internal applications when used in accordance with manufacturer’s recommendations. Isagenix Content blended oil boosts healthy metabolism, helps to control overeating urges, supports weight management goals, supplies an energy boost during exercising, and promotes a positive mental attitude. Topical use of Isagenix Content provides a revitalizing energy boost before starting an exercise workout, promotes a feeling of positive wellness, and encourages weight management goals. Aromatic use of Isagenix Content fills the air with a warm, spicy herbal aroma that promotes a sense of relaxation and provides a positive mental outlook while encouraging weight wellness. Internal use of Isagenix Content supports a healthy metabolism, provides an energy boost for a successful exercise workout, and provides a management aid to control overeating urges. Weight Management Tip: Isagenix Content is an ideal aid for Shake and Cleanse Days. Topical Uses: (a) Undiluted – 1-3 drops of oil rubbed on the stomach area to control hunger urges and boost metabolism; (b) Diluted – mix one drop of oil with 10-12 drops of the carrier Isagenix Essence Coconut Application Oil prior to applying to the desired body area. Aromatic Uses: (a) Put 8-10 drops of oil in the Isagenix Essence Aromatic Cool Mist Diffuser and place in the desired area for revitalizing and relaxing air freshness; (b) Inhale directly from bottle to increase metabolism. Internal Uses: (a) Add 4 ounces of liquid for every 1 drop of essential oil to be ingested; (b) Add a few drops to any Shake product. Due to the strength of pure essential oils and to avoid searing to a plastic surface, it is best to mix the blended essential oil in a glass or ceramic vessel. INGREDIENTS: Isagenix Content is a carefully formulated proprietary blend of essential oils that are effective for supporting personal wellness and weight management goals. The blended oils include: Bergamot, Cinnamon Bark, Citronella, Copaiba, Eucalyptus, Grapefruit, Juniper, Lemongrass, Mandarin, and Orange. PRECAUTIONS: Prior to the first application of Isagenix Content, test for possible skin sensitivity by applying oil to a small patch of skin prior to use on large skin areas. Keep out of reach of pets, small children, and infants. If taking medications, if pregnant, or if nursing, always consult with your primary medical professional prior to any health care changes. Avoid direct contact in the inner ears, on sensitive skin areas, and in the eyes when using any pure strength blended or single essential oil. 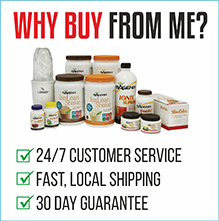 How Do I Buy the Isagenix Oil Content? 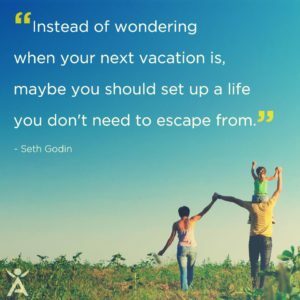 RECOMMENDED: Sign up and Save (CA$24.99 Signup) — Sign up to the Isagenix autoship program to become eligible to have access to the cheapest wholesale prices. At the end of the checkout process you’ll be asked to set up your next month’s order. Autoship can be cancelled at any time, even after you take advantage of the cheaper prices on your first order! There are no locked in contracts of any sort. Plus, this gives you the opportunity to participate in the Isagenix business (this is 100% optional). Full Retail (CA$33.32) — If you prefer not to sign up and take advantage of the lower pricing, you can purchase the products at full retail price. This is not recommended as you can cancel autoship at any time.